In honor of Samhuinn, a festival of beginnings and endings, today we’ll explore the most sacred of trees–the hawthorn. 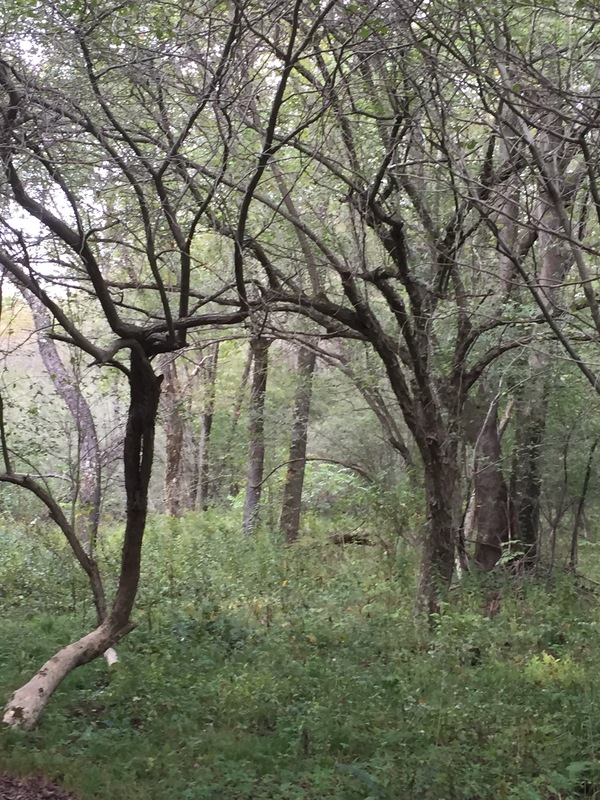 This is the 6th post in my “Sacred Trees in the Americas” series where I examine abundant trees in the Eastern and Midwestern parts of the USA, exploring their many qualities: physical, magical, herbal, mythological, and so on. 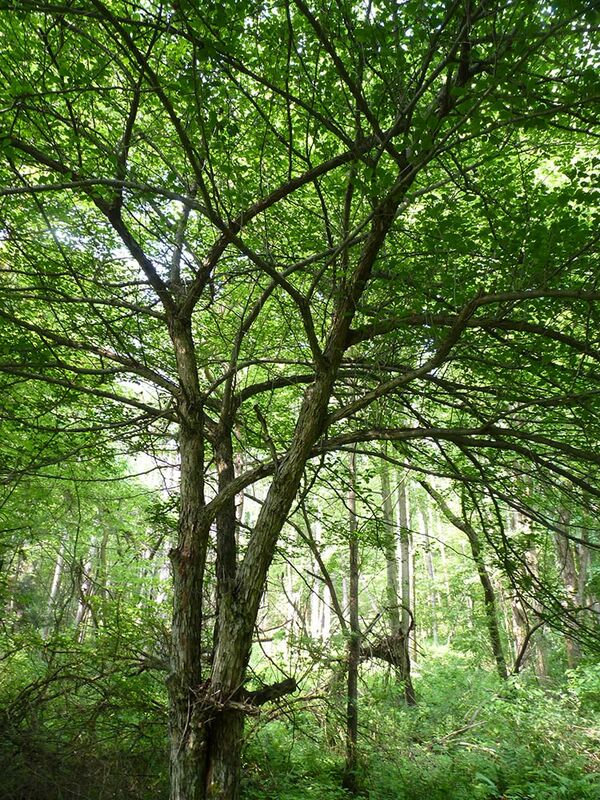 Previous posts have include Eastern Hemlock, American Beech, Sugar Maple, Eastern White Cedar, and Hickory. Each of these posts takes 20-30 hours to research and write, not to mention the countless hours I spend with the trees to understand them and share their stories as best I can. And now friends, let’s enter the forest and visit the hawthorn. 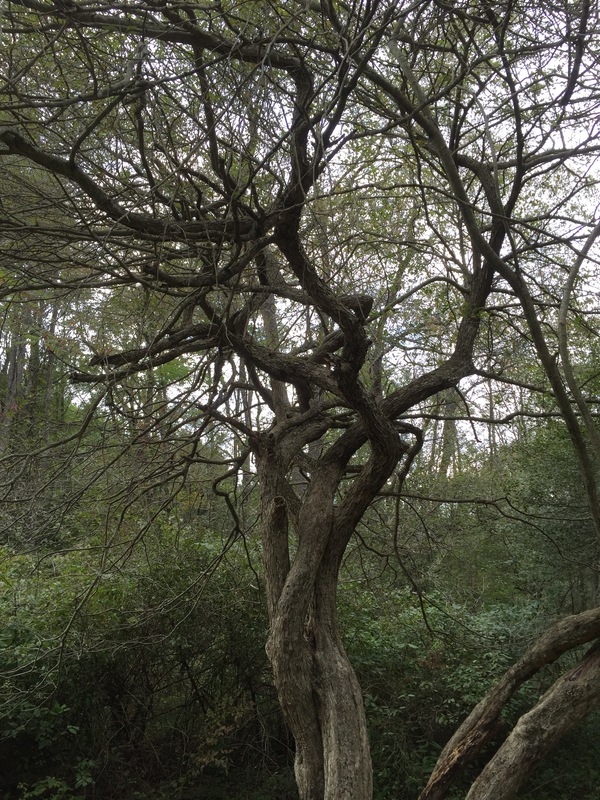 There are few trees quite so enigmatic in either western herbalism practice or contemporary druidry as the sacred hawthorn—and this is the first of the sacred trees of the Americas series that is included in the traditional Ogham, although I want to add to our knowledge of this tree. With its small, tart berries, its lovely white or pink flowers, and its thorny, protective trunk, this is a tree that has woven its way into the hearts and tales in many parts of the world. And certainly, its a tree that has much power during this sacred time. I remember when I was a child, running through the hawthorn grove behind my house. 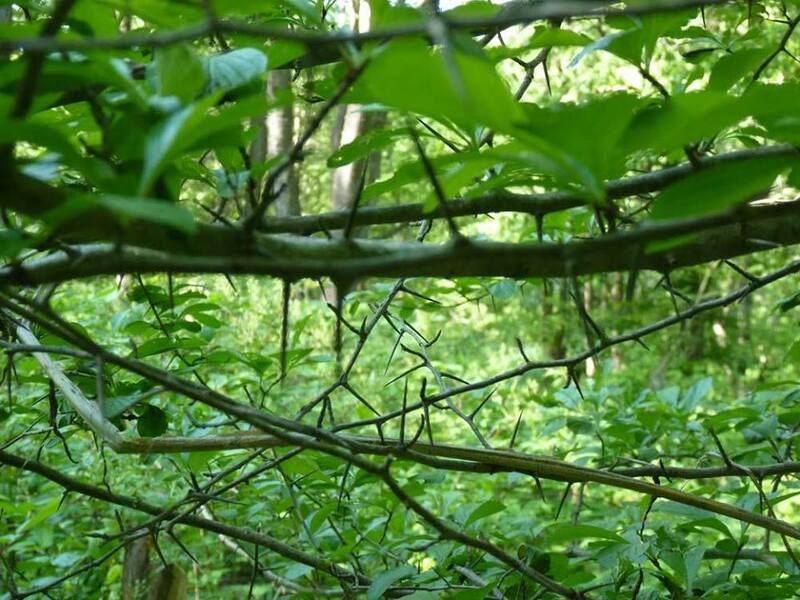 Hawthorns here in Pennsylvania, as in many forests, function as under-story trees, so they would grow in the second layer of the forest—and the forest in parts was thick with them. We would gather apples from the crab-apple on the hill, and place them in the thorns of the hawthorns as “offerings” to the trees so that they could let us pass into the forest, which we believe was another realm. We would gather the thorns and stick them into the mud or in the sand in our sandbox to create mini groves of thorny trees, a wonderland of its own. It’s amazing to me now, in studying the ancient lore of the hawthorn tree, how our instincts and intuition as children are often right. As an adult, I would be thrilled to come across a hawthorn in full fruit, ready and waiting for a harvest. Just as I was a child, I would first leave an offering in that tree’s thorns (an apple, a piece of bread, a song on my flute) and then pick the haws (fruit) from the tree or the ground—they are ready when they give freely, and they drop when you pick them. Many trees, when you work with them, bestow some of their gifts just from being near them, from harvesting from them, from breathing them in or sitting next to them. Hawthorn has always had this effect on me—when I was heartbroken, harvesting flowers and then preparing them simply soothed my aching heart. Come with me now, into the grove of the Hawthorn tree! Hawthorns (Crataegus spp) have many folk names including thorn, thornapple, may-tree, whitethorn, quickthorn, mayblossom, hagthorn, hedgethorn, quickset, hawberry, halve, bread and cheese tree, Huath, lady’s meat, may bush, tree of chastity. According to Grieve’s herbal, “quick” terms come from its ability to quickly grow; the “hedgethorn” name comes from its ability to produce effective hedges (more below), and whitethorn from its light coloring. The Latin word for the tree, crataegus, comes from the Greek kratos hardness (of the wood) and akis sharp, suggesting these trees have sharp, strong thorns. Hawthorn trees are a whole range of sub-species that usually have slightly different bloom and berry ripening times; nearly all are used interchangeably in herbalism and magical practice. Its range spans most of North America and is likewise found in Asia and throughout Europe. Not all varieties are trees—some are rather large shrubs—the ones that make good hedges. All of the, however, have their enigmatic thorns—the secret to both the medicine and magic of the hawthorn tree. Hawthorn trees are an important part of the ecosystem, being a nectary for insects in the spring and providing food and shelter for many birds and mammals. Because the haws are a very late-dropping fruit and some may remain on the trees even into the winter, thrushes and cedar waxwings will eat them and spread the berries through their droppings. Certain moths and butterflies feed exclusively on the nectar and leaves of the hawthorn tree. Hawthorn has long been a hedge plant; the German word for Hawthorn is Hagedorn; haw is also an older word for hedge. Hawthorn, especially in the UK, was planted heavily in hedges for boundaries to fields; while it was used throughout the ages for this purpose, in the 18th and 19th century with new fencing laws, the hedges grew even more prominent. It was from these hedges, full of medicinal and magical plants, that the “hedge witch” term derives. In terms of human uses of hawthorn, it has a very hard and rot resistant wood, and so in the US, it was used frequently for fence posts and handles, even in some cases for wood engravings and carvings. M. Grieve reports that hawthorn root wood also has a fine grain and finishes well—so the root wood is used for decorative boxes and combs. Charcoal of hawthorn is so fine that it was apparently used in pig iron furnaces for the creation of “coke” for making steel—although given the strong prohibitions against cutting or burning it, I’m surprised that anyone would use it for charcoal! One of the physical problems that hawthorns have in the USA (especially those where I lived in Michigan) had was Rust (cedar/apple rust blight). This rust was carried by Eastern Red Cedar (juniper) trees and was transmitted to any apples or hawthorns in the area, sometimes being fatal. I haven’t seen rust impacting the hawthorns here, but I noticed many of them dying off in the immediate area—older hawthorns of a dwarf variety all dead in one season—so I’m not sure what is going on. It is worrisome. A final use of a hawthorn tree is that of a rootstock or graft for other related cultivars—primarily for quince, pear, or medlar. From a permaculture design standpoint, this is wonderful to know, because you could end up with a hawthorn tree that also has pear, medlar, and quice grafts—what an abundant opportunity! For medicine making, the flowers and leaves can harvested, along with the berries. Of course, if you harvest the flowers, there won’t be berries, so there is always a choice to make! You can use a pair of scissors or just your hands to harvest leaves and flowers. Do realize that many hawthorns, especially in their flower stage, are home to a variety of insect life. Shake the branches and check the flowers and leaves carefully before drying them, tincturing them, etc. Let the life that lives on the flowers stay outside to gain the hawthorn’s blessing! Later in the season, the hawthorn berries ripen—depending on the cutivar, either rin September or October (if there are many hawthorn trees around, you’ll be able to harvest for 1-2 months straight from different trees!) Hawthorns, like apples, give of their haws (fruit) when they are ready—when you lightly tug on the haw and it is ripe, it will come easily from the tree, and likely others with it. If you tug on the haw and you get resistance, come back later, and the fruit will be ready. Or it may be all on the ground, which is a fine place also to gather it up. When they are perfectly ripe, they start dropping to the ground in quantity. 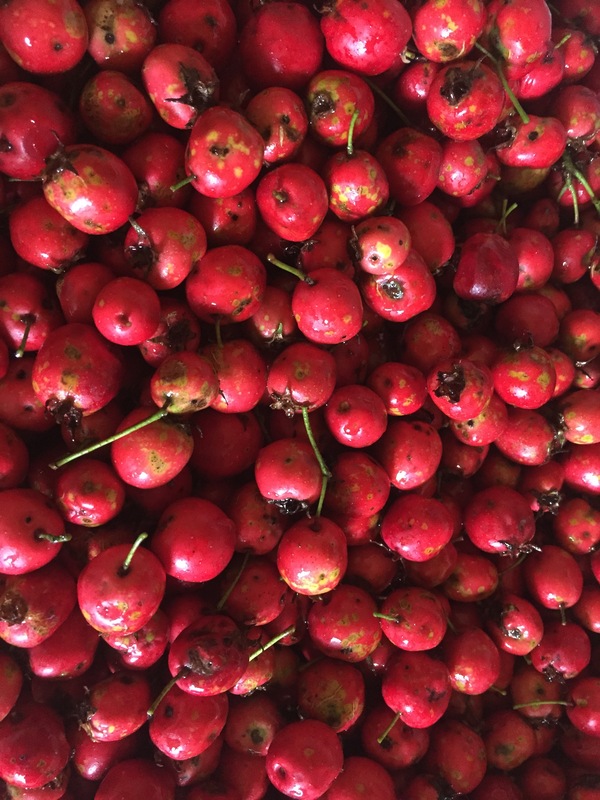 When harvesting haws, there are all shapes and sizes – larger ones almost crab apple sized and tiny ones no bigger than the tip of your pinky finger. Hawthorns can come in red (most common), yellow and black (least common) varieties. In terms of harvesting, some hawthorn trees are more “friendly” than others, meaning they have less thorns on the branches. I’ve met trees who simply aren’t interested in being harvested by humans—they have lots of thorns on the branches and stick you with them when you reach in. Better to find a nicer hawthorn tree—many are quite personable if you give them an apple or something as an offering! After harvesting, check your hawthorn berries for worms. Hawthorn berries often have small worms in them (again depends on the tree), so I find its easiest to use a masher (like a sauerkraut masher, a solid wooden one) on a wooden cutting board. I smash open the berry with a gentle tap, see if there are worms inside, remove the seeds ,and then dry it or tincture it or whatever. If there are wormy bits, I simply remove them and use the rest of the seed. You do want to remove the seed of the berry for sure—the seeds, like the seeds of apples and cherries, contain cyanide. Culpepper notes that hawthorn is a tree of Mars. He also suggests that a distilled water of the flowers “stays the lax” (translation = keeps leprosy away) and will draw out thorns or splinters. If the seeds are bruised and boiled in wine, its good for “inward pains” (pretty self-explanatory). Gotta love Culpepper! Physcial heart healing: More modern knowledge of western herbalism recognizes that Hawthorn is one of the greatest herbs anywhere on the planet for use in healing the heart—both physically and emotionally. Hawthorn functions as a troporestorative, that is, it has long-term restorative benefits to the heart and circulatory system when taken over time—it heals the heart and helps it function better. Unlike many traditional remedies, hawthorn has a wide variety of study from aleopathic (modern) medicine, so the uses are backed up by scientific study. It is used for high blood pressure, where it relaxes tension and helps dilate the blood vessels to allow blood to flow more freely. It strengthens the heartbeat and aids in smoothing out the rhythm of the heart. The berries are anti-inflammatory and anti-oxidant. 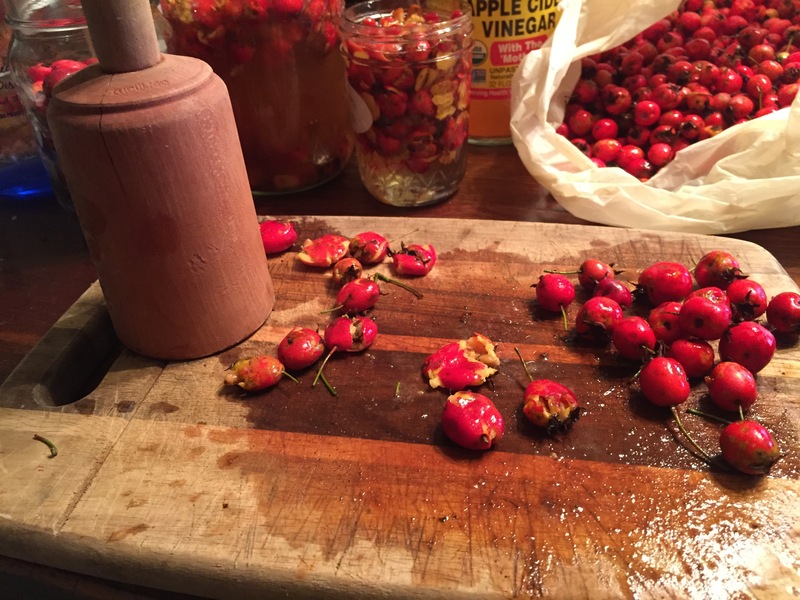 Medicine making with hawthorn – here’s my masher! Sore Throats and inflammation: Flowers and berries are astringent, according to M. Grieve, and therefor useful in a decoction for sore throats (especially the wet, goopy, inflamed ones, given hawthorn’s anti-inflammatory powers). Soothing Hot Excesses: Hawthorn has a potent nervine effect of calming the heart and soothing hot excesses. Herbalist David Winston uses hawthorn for ADHD clients to help calm down a bit as he illustrates that hawthorn calms the spirit. Herbalist Sean Donohue uses it for stress induced asthma. In each of these cases, we see hawthorn having a calming effect on the nerves and the heart. Overall, Hawthorn is a mood brightener and mood lifter. 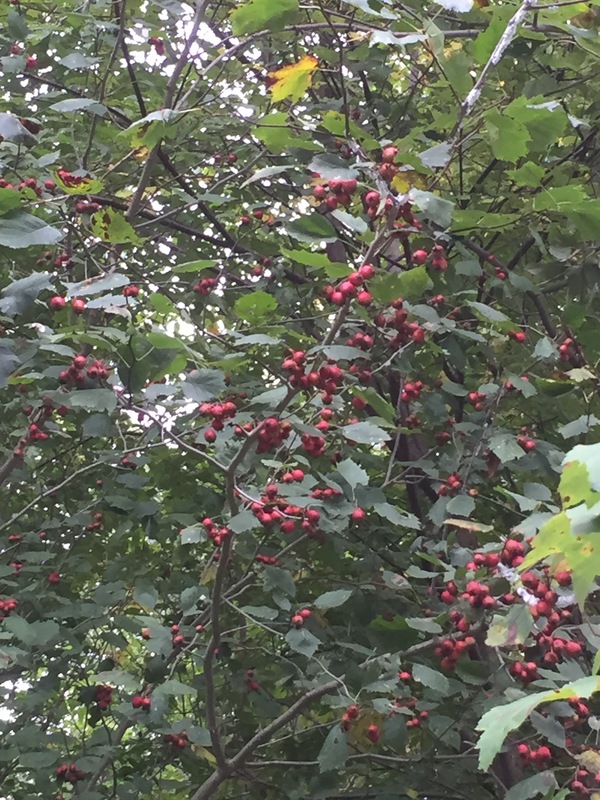 In his Cherokee Herbal, Garret reports that the Cherokee likewise used hawthorn as a relaxant. Emotional heart healing: On the emotional and spiritual side, hawthorn is a great herb for heart healing. Herbalist Jim McDonald also uses it to help people establish their own emotional space. As Jim McDonald has discussed, about anytime that you’ve had heartbreak—you can literally feel your heart hurt, and wounded, and as part of this to prevent further hurt, you close up/constrict yourself and are unwilling to open yourself again. Hawthorn helps us heal from this kind of emotional damage—we can see this in the tree itself, who offers its medicine freely but also creates a protective space with its thorns. Hawthorn, therefore, provides an energetic/etheric protection to the heart and helps us establish our own space. Hawthorn is a wonderful tree to help with heart guarding or heart healing. You can use this energetically or physically. 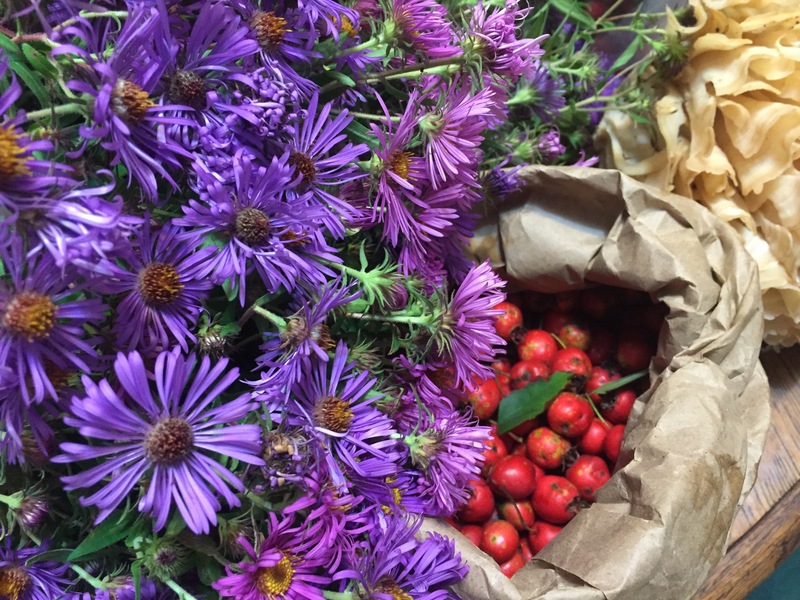 According to Jim McDonald, it can be as simple as carrying a bag of haws with you or rubbing tincture on your heart. It can be a daily ritual or affirmation and can help you connect with your intentions. You can use it for emotional issues, emotional body army, emotional overprotection. David Winston says that Hawthorn calms the heart and spirit, especially calming the spirit when the spirit is easily affected by what is around a person (because of this, he uses it to treat ADHD/ADD). In terms of making medicine from hawthorn, the most complete medicine is a combination of flowers, leaves, and berries in a tincture; you can also make decoctions of berries; tea with leaves; tincture; herbal vinegar; glycerate; elixir; hydrosol (flowers); syrup; and food (conserves, jellies, jams). Teas: To create teas (infusions and decoctions) from the hawthorn, use the leaves and flowers or de-seeded berries. For a strong medicine, pour boiling water over the leaves and flowers, seep for 10-20 min, and drink (with honey, if you’d like!). For the berries, bring water to a boil, add berries, and boil covered for at least 20 min (depending on if they are whole or smashed prior to drying). Syrups: Chop of hawthorn and cover with 1 quart of water. Boil this for an hour or so, then strain the berries. Boil it down to 1 cup, then add your choice of sweetener (honey, maple syrup). Paste: Hawthorn berry powder can be made into paste or pastilles with a bit of honey. Spread it, ball it up and eat it, however you’d like! Hawthorn Schnapps: Tincture of fresh berries in lower-proof vodka (80proof) for an enjoyable beverage! A pregnancy infusion for preeclampsia: hawthorn, nettle, raspberry leaf, and oat straw: this functions as a troporestorative for the liver and can be used as early as the 1st trimester. In this series, one of my main goals was to examine how trees, like hawthorn, work in the North American context. Unfortunately, there isn’t much to be found in the Native American literature on the hawthorn (which is surprising, given how prominent this plant is in most other parts of the world where it grows.) One of the few stories I could find was a Chippewa legend, “Why Porcupine has Quills” where porcupine is being hunted by bear, and he needs some defenses. He takes hawthorn branches and places them on his back, and when Bear came to eat him, Bear was pricked by the thorns and went along his way. Nanabozho, a trickster god, witnessed what happened and was impressed with Porcupine’s tricking of Bear. He took hawthorn branches and thorns and peeled them so they were white, then put some clay on Porcupine’s back and added the thorns. Ever after, Porcupine was protected from those that would eat him, like Wolf or Bear. In another tale, a Senaca legend, a bird (personified as a woman) is in search of her mate. She sings to men along a riverbank, and eventually settles on seeds to eat. In this story, Hawthorn is what is eaten by the bear, her second suitor. The only theme I gather from these stories is the “protective” role that hawthorn plays, which we certainly see physically as well as medicinally in the plant. When we examine the lore in other parts of the world, particularly the British Isles, a more elaborate picture emerges. Hawthorn as a Gateway to the Otherworld. In the lore of many tales specific to the Celtic Isles, hawthorn is a gateway tree; that which holds a doorway between our realm and the fairy realm. This is clearly discussed throughout the lore and literature. One such example (of many) comes from Sir Samuel Ferguson’s “The Fairy Tree,” where a group of maidens sneak out to dance on a hill with the hawthorn (the fairy tree), ashes, and rowans. They slow down and quickly fall asleep and are enchanted, “For, from the air above, the grassy ground beneath, and from the mountain-ashes and the old Whitehorn between, a Power of faint enchantment doth through their beings breathe, and they sink down together on the green.” The fairies come to visit them (and I’m not talking about Walt Disney fairies here), and one of their number, Anna Grace, is taken away and never seen again. The Magic of Sleep: As the above story describes, Hawthorn has the power to put people to sleep. This is explicated in another story, The King of Ireland’s Son by Padric Colum from 1916. In this story, the King of Ireland’s son is in love with a woman, Fedelma. At one point in the story after her love, the King of Ireland’s son falls asleep and will not awaken, she asks the King of the Land of Mist to pluck a hawthorn branch and put her to sleep as well—she does this, and for part of the story, she stays asleep as long as the hawthorn branch is with her. A Tree of The Heart: Lady Francesca Speranza Wilde also describes a traditional Irish Wedding. In that Wedding, the bride and groom meet with guests in a field under a large hawthorn tree covered in colored fabric and with rush candles in the branches. This heart connection can be seen woven all through the medicine and magic of the hawthorn tree. I would be remiss if I didn’t look to the Hawthorn Tree in the druid tradition. In Iolo Morganwg’s Barddas (1862), Iolo presents a magical alphabet called the Coelbren of the Bards, derived from Welsh and a wooden frame called a pillwydd which the letters can be carved into. One of the trees Iolo suggests is Hawthorn. (For more information on the Coelbren of the Bards, see John Michael Greer’s article in Trilithon: The Journal of the Ancient Order of Druids in America, Volume II). Hawthorn, or Huath, represents the letter H in the traditional Celtic Ogham. Numberous interpretations of the hawthorn exist—let’s take a look at two of them. In the Druidry Handbook, John Michael Greer describes the hawthorn. His upright meaning for it includes, “Patience, reserve, retreat. A time of waiting and planning rather than action. Obstacles that can be overcome. Success after a delay. Temporary obstacles.” Reversed, it’s the opposite, “Inappropriate action, rushing ahead when patience and planning are called for. A risk of failure. You need to stop and reconsider” (p. 82). In both of these cases, we see hawthorn being connection to either the right timing, overcoming obstacles, or taking the action at the wrong time. The Greek concept of “kairos” which is summed up “right time, right place” comes to mind here. Hawthorn gives us messages of the heart, and if we can listen to our hearts, we know when the right (or wrong) time to act is. In a second book, Celtic Tree Mysteries, Steve Blamires also describes the hawthorn in detail. His discussion of the ancient lore on the Ogham from the Book of Ballymore links the hawthorn (whitethorn) to a pack of “meet of hounds” that is “formidable owing to its thorns” (44). Blamires also notes that the letter H in Galeic grammar is neither consonant or vowel, but functions to strengthen other letters. Cuchulain, the great hero of the Ulester Cycle, provides his own list, indicating that hawthorn is “difficult night” (47) and a whitening of the face. Blamires, in his own interpretation, suggests that Hawthorn not be invoked during magical work, but rather that it be used as a “warning to the magician to prepare for something about to happen” which might be backlash for some kind of action(111). His interpretations stem from the idea that the thorns of the hawthorn, along with the old terminology, suggest that the hawthorn is hostile but can also be defensive in its thorns. He concludes be suggesting that hawthorn may bring about disruption, but this disruption is temporary and can be put to positive use (113). The hawthorn, with its protective thorns, has flowers with five petals (in which a shape of a pentagram can be drawn); the leaves are typically divided into either three or five segments. My own experiences with hawthorn are a bit…whimsical. I have found that hawthorn trees generally like to be seen when they are ready. Northeast of the sacred circle on my former homestead in Michigan is a line of trees; within that line, a hawthorn. I had lived there and worked to establish and maintain the circle for years….only three years after I moved in did I see the hawthorn tree. Once I saw her, she beams at me radiantly. I found another hawthorn just across the property line in my neighbor’s yard; it had also been there for some time, but I was only ready to see her when I was ready. 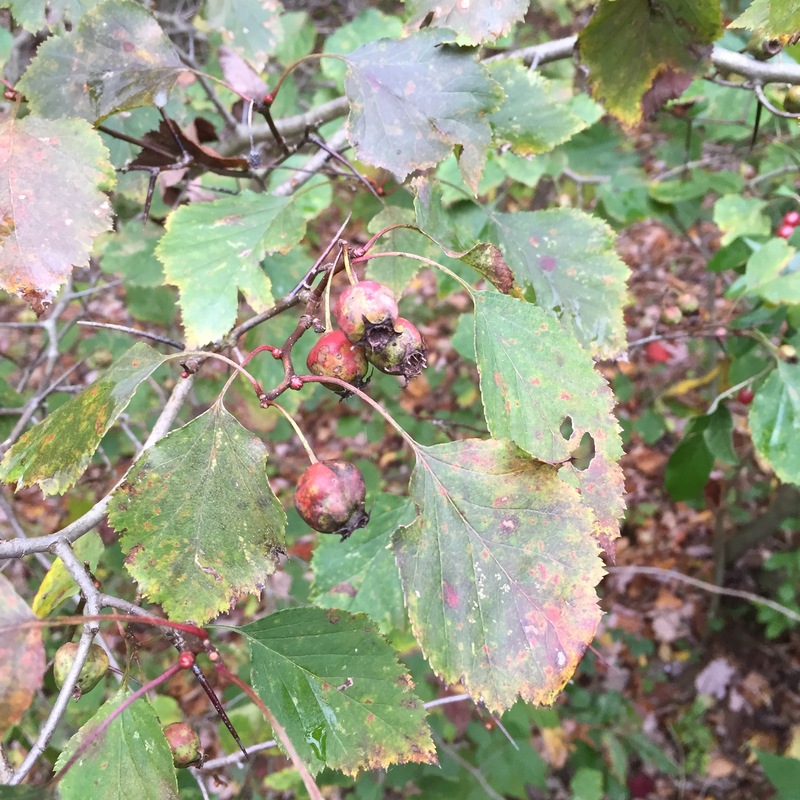 For several years, every hawthorn I had visited in my immediate area in Michigan was not blooming and was not bearing fruit due to a rust that was harming the trees. I had hoped to gather flowers in May to make a tincture and glycerite, but never managed it. Then, just when I needed it, the hawthorn was there. I remember a fine spring day, not very long ago, when I was making the transition from Michigan to Pennsylvania. Less than 12 hours before I was to leave Michigan, I had received some news that really broke my heart, and I cried on my drive most of the way home (I was visiting my parents before moving into my new home). The morning when I awoke in the home of my childhood, I walked down into the woods, and saw that the hawthorns were in full bloom–huge hawthorns, bigger than any I had ever seen, all covered in their beautiful white flowers. I had been so sad since I had arrived home because of the news. I gathered the flowers later in the day, and that evening, I simply sat with the fresh flowers, picking out the little green bugs and inch worms that had made them their home. As I sat, I could feel the energy of the hawthorn flowing over me, calming me, and soothing my heart. It was a transformation–even in the process of making the tinctures, I was amazed in the healing power of those flowers. Needless to say, I partook of the hawthorn each day after that–it is truly a plant connected to the healing of the heart and also the mystery and magic of the land. My entry on this tree is longer than some of my others, because it seems that we have two, potentially contradictory aspects of hawthorn showing up in the literature. My experience with individual hawthorn trees is that each unique hawthorn tree has a range of mannerisms—from those that freely give of their haws when you come near to those who stick you repeatedly just from walking by. The trees with opposite mannerisms might be growing next to each other—I find that when I am out looking for flowers or haws for medicine, the individual temperaments of the trees vary widely. On one side, we have this super-protective, heart healing plant, that is some of the best medicine that we know of for the heart and a plant that, in the Native American lore, also demonstrates protection. On the other hand, we see that it bodes of warnings and things not to be trifled with—the “whitening of the face” and “pack of hounds.” I think both of these are equally true of the hawthorn, and perhaps, represent light and dark sides of this tree, like two sides to a coin. Hawthorn responds differently depending on how you approach it. If you ram yourself into a hawthorn, its going to hurt and you aren’t going to get anywhere—and you may wish you never came upon it. But, if you are mindful, you can can carefully work with it and reap rewards. If you are true of heart and kind go the land, the hawthorn is likely to be your ally. It’s a tree of mystery and magic, as much as it is a tree that opens the heart. Its defensiveness can be aggressive when warranted, but nurturing when it wants to be. Special Thanks: I want to specifically thank Jim McDonald for sharing his knowledge of this amazing tree. What a beautiful post, Willowcrow. I love Hawthorn. We have only one on our land. Sadly, it is dying. We picked a bunch of berries when it was healthy, kept them in the freezer over winter and planted the seeds, but not successfully. It might be a very old tree, planted by the people who lived here in the 1880s or I don’t know…I love it and wish I could save it. I don’t know if we are in a good place for it. Our growing season is pretty short. Each year we get fewer flowers and of course fewer berries. Sad. Thank you for all your research and information you shared about the beloved Hawthorn. It is such a heart healing tree. I may have to buy a tincture, but that’s ok. At least I have a relationship with one. Its hard to see a hawthorn suffering. There are a bunch of hawthorns that are losing a battle with rust near here–its a really sad thing. I’ve also found that Hawthorn can be really elusive till you are ready for it. It hid from me for years! Now its super abundant. Or maybe it knows I was writing about it and studying it these last six months! But, Mountain Rose Herbs carries berries and powder–you can make your own tincture. Or, you can find some good stuff on Poppy Swap! PS: I also think that the hawthorn is close to the energies of the land, and the telluric currents are really suffering a lot. Because of this, hawthorn are suffering….at least that’s my intuitive sense of it. Love your detailed posting on Hawthorn, great work! Iâll be sharing some of your hawthorn findings on my Sunday tree walk. I have a similar story with the Hawthorn tree. For years I had taken a path to school. Then, one day, I crossed the street and was stunned to notice a tree that I originally thought was diseased. I thought perhaps there was some sort of parasite taking over the tree. The thorns were protruding from every branch and looked like a separate being – the tissue of the thorns were smooth, elegant and terrifying where the tree looked, well, like a typical tree, to my eyes. I eventually asked my Botany professor what I saw. Of course, I had identified my first Hawthorn tree and was in awe and reverence for the sort of energetic punch she delivered (or finally let me see?). I have been taking a Hawthorn tincture (mixed with Garlic Chive and Blue Cohosh) that is labeled by my provider, “Your Bright Future Beckons and Awaits.” So far, I have come to notice that the Hawthorn is entering my awareness more often – through these posts and other happenings – and that the Hawthorn, for me, carries the medicine of embracing my dark, ugly and guarded self with love, acceptance and grace. Did your provider make that tincture, or was it already made? Thank you. I will look them up. Thank you and wishes for a faery magical day with their most sacred tree. Oak, ash and thorn … see all three and you know the Fae are near! Love these posts and this one is no exception. 🙂 Hawthorn is amazing. I had a very similar heart-healing experience with the ones on our land. Ours have had a touch of rust, but not too badly yet. I’m hoping it stays that way! And a hearty congratulations on your new position as Archdruid of the East! Jim McDonald, you, and Archdruid Greer (in order of discovery) have been my main navigational aids in my recent journeys. A toast to Willowcrow! Don’t touch me tree-I like it. That sounds like hawthorn :). Witch hazel is much more pleasant, in general, and hawthorn varies widely as I mentioned. The particular tree you are describing is extremely well guarded with her own thorns and the nettles–yowzas! I wouldn’t get near her without a clear invitation. Have you left an offering? A bottle of wine might go over well. Then again, it might not :P.
Nettles (and also certain brambles–wild blackberry and wild rose come to mind) can also enjoy snagging and stinging you. These are plants that all have amazing medicine, but we have to find ways through the thorns, or stinging. And in the case brambles, we have to find our way back out! And thank you for the kind regards on my new position! Jim and John Michael are both wonderful teachers and friends, so I’m glad you are also learning so much from them :). I love these tree posts. I will be on the lookout for hawthorn now–I only know of one or two in my neighborhood, one by a public road where it would be awkward to leave offerings or do energy work. But heart healing medicine would be something I could use. I tend to have low blood pressure though, so would taking hawthorn internally be not good? Hawthorn regulates the circulatory system, and traditional herbals and studies indicate it can be used for both low and high blood pressure. Thanks for the comment, Karen! I found several younger trees about 6-12′ on my land and i pruned them of dead and crossed and overcrowded branches, like they were any other fruit tree to revitalize the growth, open the branches up to the sunlight and produce good fruit bearing wood for a healthy tree. Should I see better flowering and fruit? I believe proper pruning will make these healthy, productive trees that will be a beautiful flowering producer.